Please add the ability to jump back to last channel viewed. This is commonly referred to “Last”, “Flashback” and “Previous Channel” on remote controls. Not sure if this would even be possible with how the Tablo is designed. I simple button to the left of the (<20) and (>30) skip buttons would work. Also, aren’t most “Feature Requests” requests for design change? Flashback could be implemented “in theory” in practice though, it wouldn’t be much of a “Flash” because the device would still need to buffer up some video. We could conceivably do ‘last channel (tuned’ so you could flip back & forth between two previously tuned channels. It’s something we’ve definitely discussed. Count me in on this request. Thx! Thank God. At last a future feature request I could use. This might actually help satisfy my compulsion to channel surf. Hi. I just bought a Tablo a couple days ago. The Last channel feature would be a fanastic addition. It did not take me long to realize this should be a standard feature. I like the idea o PIP too! Thanks for your time Tablo Team! @Richie - This feature is actually on our radar… Stay tuned! This is a feature I’d really enjoy. I read that Tablo automatically buffers the last two channels viewed. However, there is no way to easily switch between the last two channels. Perhaps, the “A” or “B” button on the Roku remote could be used for this purpose. Just wanted to chime in with this “Flashback” feature request. Just purchased and set up a 4-tuner Tablo last week. LOVING it – but there’s still quite a learning curve, including learning to get by without the nifty option of jumping back and forth between two channels. So, yes, please if and when you can?? Any new status on this request? It will eventually make it to all the apps I assume. 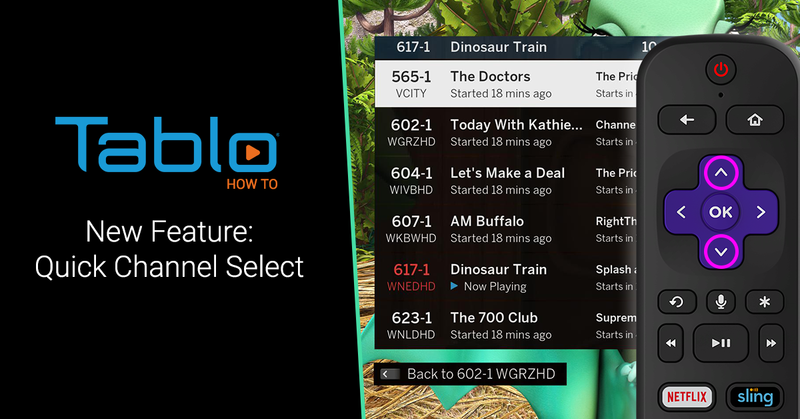 Recently, Tablo’s main lean-back (aka TV-based) apps received a new feature that we call Quick Channel Select.